If you’re wondering how to sing properly and whether you’re on the right track or not with your singing - this article is going to be just what you’re looking for. What I hope to give you today is a “cheatsheet” for how to sing properly – so you have a good yardstick of what to look out for and how to know if you’re on the right track or not. Sound good? First up – I’m Phil Moufarrege and I’m a pro singing teacher. I had to learn singing from scratch and I know what it’s like to go from straining my mind out through gigs feeling like my voice is slamming up against a wall, to being able to sing difficult material consistently, day-in-day-out with EASE. I want to share a few things with you that I’ve learned on my journey. Singing should NEVER hurt or feel constricted - no matter how aggressive your style of singing is. Every note higher and higher should NOT feel like you’re slamming your voice against a wall. While singing is not effortless, it certainly should feel EASY and COMFORTABLE. I’ll say that again. Singing SHOULD FEEL EASY AND COMFORTABLE. What? Easy??? Even the high stuff? Can singing REALLY feel EASY? Even powerful high notes?? YES!! Now this doesn’t mean you won’t be challenged! It doesn't mean there won't be any effort! Especially when LEARNING a new song or rehearsing. There will definitely be concentration involved and bodily effort to support the voice. However, the physical sensation in the throat should be free, not restricted or strained, and the more free it is, the more confident and trusting you will be in your voice. As you get used to the song, you should be able to sing it with better accuracy and control, and it should FEEL easy – yes, even the high powerful notes. If it DOESN’T feel easy, you'll never be able to truly let loose with it on stage and maintain good technical accuracy. If it doesn't feel easy after training the song then you’re likely either trying to sing the song outside of your sweet spot, or you may need expert guidance to further develop your vocal technique. Now…just because singing can feel easy doesn’t mean singing is EFFORTLESS! You simply cannot approach powerful sounds with a limp and passive body. If you try, your throat is likely going to lock up and strain. Just like you cannot lift big weights in the gym by being passive – the body has to WORK, but it must work EFFICIENTLY. Meaning there are muscles that need to SUPPORT the voice, and other muscles that need to RELAX. Your voice will be the most relaxed when the entire body is engaged in the RIGHT KIND OF WAY. Singing is ATHLETIC but also FLUID and sometimes more bodily effort is required to make singing FEEL EASIER AND MORE FREE. 1. Don’t add a song to your setlist until it’s EASY. Now this isn’t always possible, but it’s something you should strive for as much as you can. If a song is too hard for you, you’ll be under so much pressure to make the song sound good that you'll sacrifice your vocal freedom to do it. You’ll start to manipulate and force your voice in order to “survive the song”. Trust me, don’t do this!! You may even sound great to the audience but it won’t FEEL good as you sing it! This is not what you want!! This will start to tear down your voice over time and singing will become harder and harder instead of easier! It’s not enough to just sound good – it needs to FEEL good also as you sing it!!! What I recommend you do is find a key where the song is comfortable and shows off the best qualities of your voice. Be creative and make the song your OWN and do it YOUR WAY. 2. Get the song feeling easy and accurate BEFORE adding stylistic elements/colours/distortion/grit etc. If the song is feeling difficult and rigid, remove all the stylistic qualities/colours etc. and focus on just EASE and PITCH. SLOW DOWN THE SONG and practice it one line at a time very slowly. Take out the variables. Find freedom FIRST before exploring style. Then you can work from there and figure out how to go about getting closer to the colours you want without losing that freedom. If you focus on freedom, your singing will become more consistent, easy and sound more natural. Your vocal cords will approximate to the right pitches more accurately (provided you don’t have an ear issue) and from there you can start to add back in the colours/textures/distortion/grit without sacrificing your freedom. You should be able to hit any note in the song, sustain it, and then be able to fade in and out of the note (crescendo) from soft to loud. Each note you sing should feel like it’s stable and floating. If you can do this then you really are in control of the song. If you cannot do this, then it could mean your voice is stiff, lacking freedom and your technique needs work. I know this is easier said than done but it's something you need to strive for. This is a huge one. Singing loud and high songs (belting) should make your light and medium volume singing EASIER. If you feel like after singing loudly your voice is now more clunky, has a lot of vocal fry, and there’s a ceiling and vocal break where there wasn’t one before, then your approach to loud singing is off in some way and is actually tearing down your voice. "singing properly" basically means you are able to sing with freedom and ease. A song is not ready to perform until you can sing it with EASE. Don't worry about trying to stylistically sound cool until the song FEELS GOOD as you sing it. You should be able to sustain any note in the song and fade in and out of it with good control. Singinging powerful high songs should not negatively affect your lighter voice. 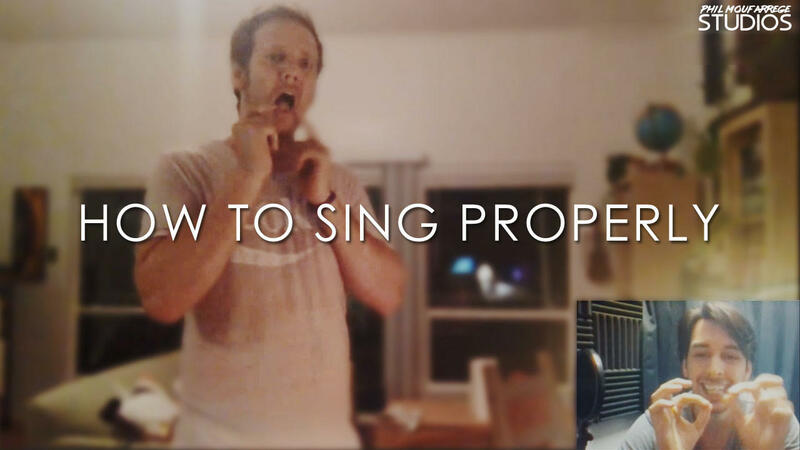 So there you have it – some clear guidelines that’ll help you know if you’re singing properly. If you found this article useful, please leave a comment below and let me know what you found most interesting/surprising or what your biggest takeaway from this article is. P.S. If you’d like to sing with more freedom, vocal range and consistency, then you can take Skype lessons with me or get my home training system. Both will put you on the path to singing properly. SING WITH GREATER FREEDOM & CONSISTENCY. Get my FREE mini-course and discover how to start singing with greater vocal freedom, range and consistency. Get my FREE mini-course and discover how to start singing with greater vocal freedom.